As a teenager looking for a creative outlet before the dawn of the internet, I learned how to knit. Sitting by my stepmother’s side, trading needles back and forth as she guided my clumsy hands, I came to appreciate the joy of being “crafty.” Though my knitting career was short-lived, my one and only project—a vibrant, rainbow-colored, shorter-than-most scarf—served me well on many chilly winter days (and was a point of pride). I don’t think I’m alone when I say I regret not devoting more time to my knitting when I was young, eventually putting the needles aside. The art of knitting is timeless. It’s been around since the days of ancient Egypt, where one of the first examples of true knitting—cotton socks with stranded knit color patterns—was discovered. Fast-forward a few thousand years and cozy, handknit socks are hotter than ever! 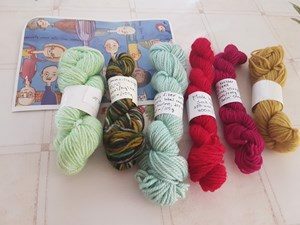 Luckily, there are artisans like Louise Tilbrook, the self-described “enthusiastic (some would say obsessed) sock knitter” behind Louise Tilbrook Designs, who returned to the craft as an adult several years ago after giving it up as a child, and has since become an inspiration to her community of Everyday Knitters. It didn’t take long to get back into knitting wholeheartedly for Louise, who hails from rural Essex in the United Kingdom. As she notes on her website, which focuses on fun ways to explore the art of knitting, “socks (and lovely hand dyed sock yarn) have become my first love and over time this passion of mine has expanded into pattern design and teaching and now consumes most of my waking thoughts.” And from that passion, a community of thousands who admire her work, and connect with her on social media 24/7, has emerged. 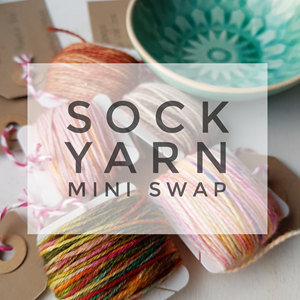 Looking to bring the Everyday Knitters together virtually to share their love for this artistic pastime in a tangible way, Louise recently hosted an online exchange of sock yarn mini skeins, giving her fellow knitters the opportunity to share their precious, coveted supplies—and to get to know another knitter who lives across the world in the process. Each participant was paired up and exchanged yarns with the same person who drew them, making the exchange even more personal. “I set up the swap and then shared the sign-up details in the Facebook group so that any member could join. We had just over 1000 online members and 80 participants in the swap, which I was really pleased with,” Louise says. And as they say, one knitter’s unused stash is another one’s inspiring treasure! According to Louise, using an online gift exchange tool like Elfster made it easy for her community to connect. “I participated in an Elfster swap previously and was impressed by how quick and easy it was to sign up. When I mentioned the idea of the swap, a few of the group members also suggested Elfster as being the ideal way to do it. Many people commented that they loved the experience, and people are already asking when we are going to do the next one,” she enthuses. So, cheers to Louise and the knitters who share her passion for the cozy things in life. May their generosity, support, and enthusiasm for their craft be a creative inspiration to us all, every day. To join the fun and engaging Everyday Knitter community, check them out on the web or on Facebook. Looking for a great way to spread a little generosity in your own community? Organize a free, online Secret Santa-style gift exchange with Elfster. It just takes minutes! Want to connect with the elves at Elfster? You can reach us via Facebook, Tweet us @Elfster, or catch us on Instagram at @Elfster.